You may be a film buff having watched great films such as The Saint with George Sanders, The Maltese Falcon with Humphrey Bogart or even some of the Hitchcock classics such as Notorious with Bergman and Grant. What do all these films have in common? Well, they were shot in a cinematic style known as 'Film Noir'. 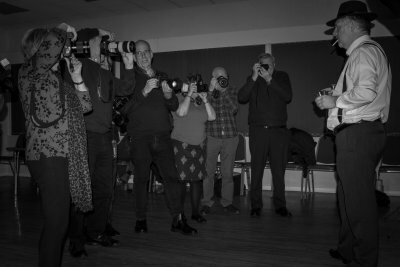 Read on to see what happen when Film Noir came to Mid-Cheshire Camera Club. Last year Ray Girling approached me with an idea for a model shoot for the club members. “Great idea,” I said wondering what the subject would be about. Film Noir is an excellent style to create. Black and white images that give an appearance of being underexposed because of the use of great shadow detail and hard light. Images and film take on a sense of dimension and character, oozing drama through clever use of light and shadow. 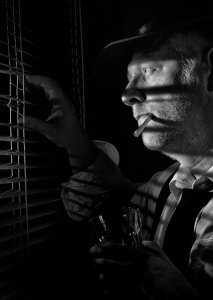 The term film noir may instantly conjure cinematic scenarios in your mind of hard-boiled detectives and brassy dames that drag trouble behind them like tattered coats. Film noir is a term introduced in the 1940s by French critics Nino Frank and Jean-Pierre Chartier. 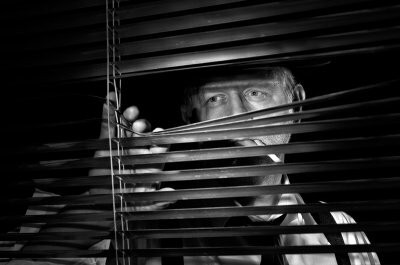 Members waited patiently as Ray set up the scene using a metal Venetian blind (camera left) typical of the ones hung in private detective offices in the 1940s and 50s. Using a two light, off-camera set up, the main light was a Godox AD200 with a gridded snoot.The snoot was positioned camera left, shooting through the Venetian blind. This was designed to focus the light on my face through the blinds allowing the shadow created by the blinds to cut across my face giving that overwhelming sense of drama. Flash power was critical here - too much and the shadows would be blown out, too little and my face would be underexposed. The fill light was on camera right and was in the form of a studio strobe set a couple of stops lower than the main light. Its job was to give me some separation from the black backdrop. After a number of test shots and a few adjustments, we were ready. Members took it in turns to use the flash trigger to capture my image and also a chance to artistically direct me into creative poses. 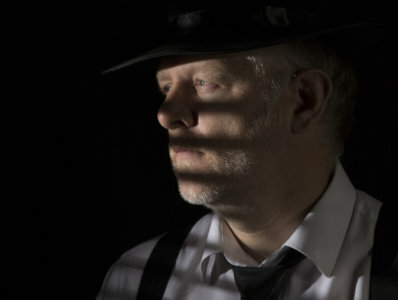 I had a number of props including a Trilby hat, braces, cigarette and wearing clothing to accentuate the mood and scene – white shirt, black tie and trousers. My experience as the model was interesting. Firstly, not a natural extrovert, I found that I was a was a little nervous, however, I soon got into the swing of things looking mean and serious whilst members asked me to move this way and that. I think this was helped by the fact Sue Girling had put on a CD of the soundtrack from the Singing Detective – very relaxing and totally chilled. I found that when I got home, I was saying things to my wife such as “Get me a drink baby, whisky, straight up.” I am not sure where the American accent came from. Joking aside, it was a great night and the results of the images speak for themselves. Thanks to Ray’s expertise, all the members got a rare opportunity to shoot in a studio setting with off-camera flash with a view of creating something a little different from the norm.